Patrick Dennis, the fictional narrator of Auntie Mame and Little Me, was the pen name of Edward Everett Tanner III (1921–1976). One of the most eccentric, celebrated, and widely read authors of the 1950s and '60s, Tanner wrote sixteen novels in all, a majority of which were national bestsellers. "Mame Dennis is the grande dame of grand dames and I, for one, am thrilled that she’s back among us. She is still hilarious, sparkling, and utterly indestructible despite the best efforts of time, neglect, and Lucille Ball." 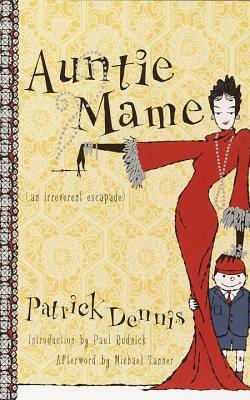 "Auntie Mame is a unique literary achievementa brilliant novel disguised as a lightweight piece of fluff. Every page sparkles with wit, style andthough Mame would cringe at the thoughthigh moral purpose. Let’s hope Patrick Dennis is finally recognized for what he is: One of the great comedic writers of the 20th century."